Vin Bruce is said to be the first musician to cut Cajun music on a major record label, which he did before World War II, and the first musician to record Cajun music in Nashville. He was born in Cut Off, Louisiana on April 25, 1932. His father, Levy Bruce, played fiddle at local Cajun dances, usually held in someone’s front room. Being from a musical family, Vin’s love for Cajun music grew and at the early age of 10 Vin learned how to play the guitar on his own. Although a shy country boy, Vin also began to sing. Eventually he became the hottest Cajun and Country recording artist in South Louisiana. On October 22, 1951, Vin Bruce signed a recording contract with Columbia Record Co. in Nashville, Tennessee and recorded all time popular Cajun songs such as “Dans La Louisiane,” “Fille de la Ville,” “Clair de la Lune,” and many others. This made Vin the first Cajun recording artist to record Cajun music with Nashville professional musicians such as Chet Atkins, Grady Martin, Tommy jackson, Owen Bradley and Shook Jackson. Vin’s fame in Nashville gave him the opportunity to be one of the first Cajuns to perform on the stage of the Grade Ole Opry. Vin is also noteworthy for having been one of the artist who performed at Hank Williams’ wedding to Biller Jean Eshliman in New Orleans, Louisiana. 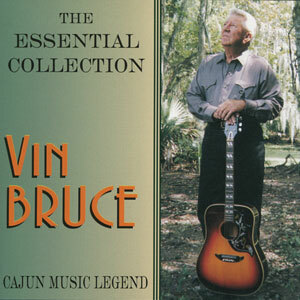 Vin Bruce has been given many credits and awards for his contribution and performance in Cajun music, including being inducted into the Nashville Music Hall of Fame, the Louisiana Cajun Music Hall of Fame in Lafayette, Louisiana, and being chosen the Lafourche Parish Citizen of the Year.